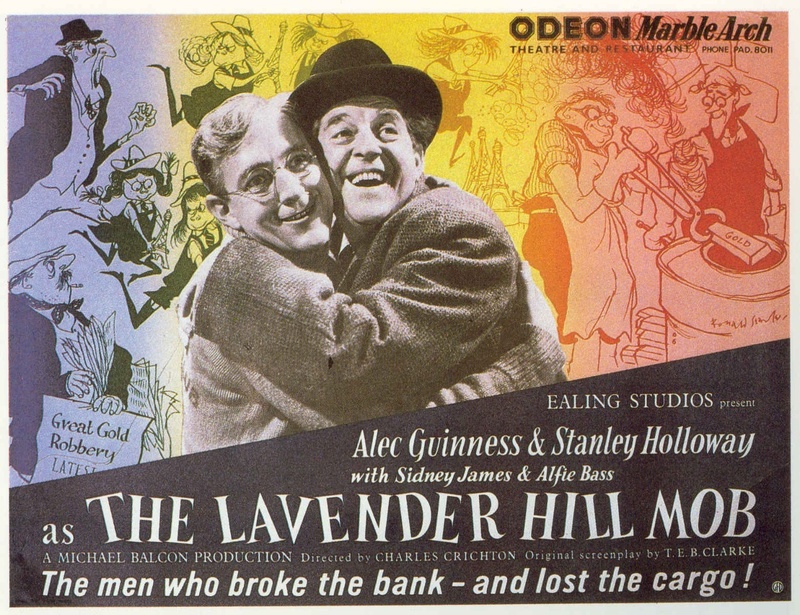 In The Lavender Hill Mob, the 1951 Ealing comedy starring Alec Guinness and Stanley Holloway, a meek bank clerk who oversees gold transports conspires with an exporter of Eiffel Tower models to smuggle £1M worth of bullion out of Britain and into France. They are charming underdog characters – the kind you can’t help rooting for – but [spoiler] they don’t get away with it. Why? The Lavender Hill Mob’s criminal failure isn’t unique. Other Ealing comedies have seen their protagonists’ evil intent thwarted by comic circumstance. The Ladykillers were beaten by the harmless Old Lady who was their landlord. The murderous Louis in Kind Hearts and Coronets inherits a prison cell rather than his family’s title. Perhaps the best example of charming criminals not getting away with it is The Italian Job (1969). Michael Caine’s Charlie is effortlessly charming and irresistibly loveable. We smile and egg him on while he builds his team, nabs the gold, and rubs the Italians’ noses in it. But his adventure ends in the most famous cliffhanger of all time. The bus, carrying the gold and Charlie’s gang, hangs perilously over a cliff edge. Charlie reckons he’s got a really good idea, but we never see him get himself out of this mess. The credits roll, and we are left to imagine that they probably don’t get away with it. Does anybody feel let down by these endings? I don’t think so. As charming as these characters are, we know deep down that they are criminals and they don’t deserve to get away with their ill-gotten gains. Also, key to their charm is their underdog nature. If they get away with it, they cease to be underdogs and therefore cease to be likeable. Defeating their plans at the last minute, to mix tragedy and pathos with the comedy, is essential to keeping these charming criminals eternally loveable. Contrast this with the 2003 remake of The Italian Job. Mark Wahlberg’s Charlie is never particularly likeable, but the film makes the critical error of having him and his gang get away with it. We even get an epilogue showing us how each member of the gang enjoys his or her stolen wealth. They are neither charming nor underdogs, only criminal scum. Ocean’s Eleven makes the same mistake. But why the difference between the old British crime comedies and the new American variety? Perhaps it reflects a change in popular attitudes: maybe people today will accept their criminal heroes getting away with it. Perhaps it reflects a difference in national temperaments: maybe British audiences prefer an underdog while Americans audiences prefer to see the American Dream realised whatever the cost. Perhaps the answer is that the film industry has become increasingly cynical and suffers from a dearth of good writing talent. Whatever the reason, crime comedies seem to have changed, and for the worse. Let our criminals be the charming underdogs of old, and let us see them lose. We will love them more for it.